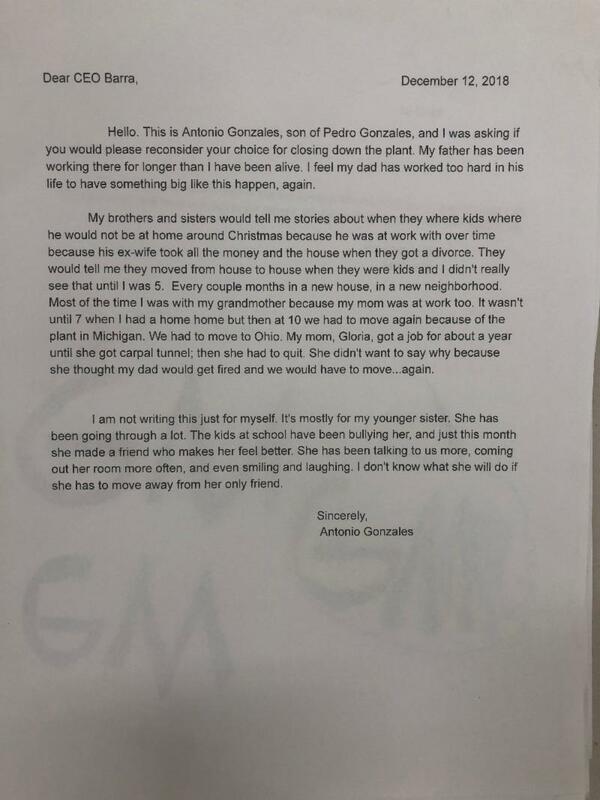 About 5,000 students from Mahoning and Trumbull counties wrote letters and drew pictures asking GM CEO Mary Barra to reconsider the decision. The artwork was displayed Monday at the United Auto Workers Union Hall as part of the Drive It Home Ohio Campaign, a grassroots effort to keep auto jobs in Ohio. Green says he’s been touched by the students’ creations and hopes it will have the same impact on Barra. UAW Local 1112 shared one of the letters submitted by students asking GM CEO Mary Barra to reconsider stopping production at the Lordstown plant. “The letters say, you know, ‘my daddy works there, and we’ve already had to move two times, and mom and dad got divorced the first time, now I have a new mommy,' and things like that," he said. "It’s just so kind of gut-wrenching, you know, that these people and these kids are gonna have to continue to go through this." Green also says the goal of the campaign is to gather letters and signs from across the state.